Global Refloats Grounded Vessel in Mexico - Global Diving & Salvage, Inc. 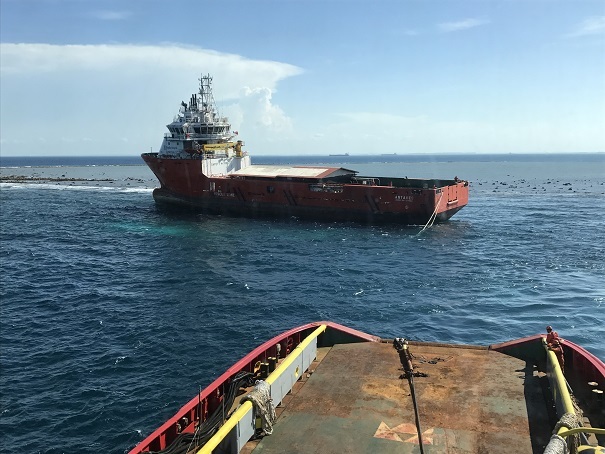 The OSV Antares was bound for the port of Tuxpan, Mexico when it ran aground on a coral reef on approach to the harbor. Utilizing translation applications and staff fluent in Spanish to overcome language barriers, Global mobilized a salvage master to the site to be on standby while the vessel’s owner attempted to refloat the vessel. After the owner’s initial attempt failed, Global was contracted to take over the removal operation. Global coordinated a tractor tug and a conventional tug to pull the Antares off the reef. In conjunction with shifting the ballast water and fuel aboard, the two tugs were used in concert to swing the stern back and forth, pivoting on the grounded portion of the vessel and ultimately floating it free of the reef. Damage assessments were immediately conducted inside the vessel to verify there was no flooding and ballast was shifted to bring the Antares back to an even trim/heel. The Antares was towed a safe distance from the reef, then handed over to the owner for towing to port and further assessment. Global’s rapid response and solution to the situation received acclaim from the client and local officials.